Change buffer merging may take several hours when there are many affected rows and numerous secondary indexes to update. During this time, disk I/O is increased, which can cause a significant slowdown for disk-bound queries. Change buffer merging may also continue to occur after a transaction is committed, and even after a server shutdown and restart (see Section 15.20.2, “Forcing InnoDB Recovery” for more information). 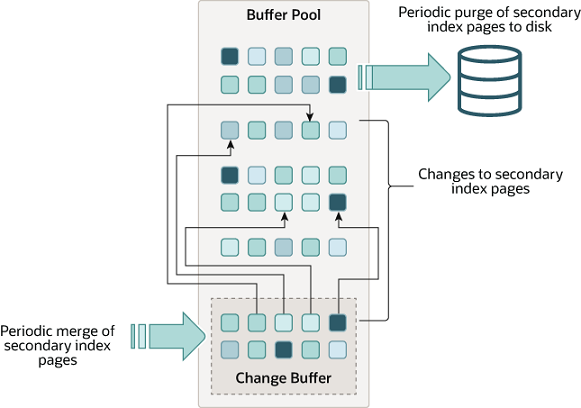 For answers to frequently asked questions about the change buffer, see Section A.15, “MySQL 8.0 FAQ: InnoDB Change Buffer”. Buffer the physical deletion operations that happen in the background. You can set the innodb_change_buffering parameter in the MySQL option file (my.cnf or my.ini) or change it dynamically with the SET GLOBAL statement, which requires privileges sufficient to set global system variables. See Section 5.1.9.1, “System Variable Privileges”. Changing the setting affects the buffering of new operations; the merging of existing buffered entries is not affected. For more information, see Section 15.16.3, “InnoDB Standard Monitor and Lock Monitor Output”. For INNODB_METRICS table usage information, see Section 15.14.6, “InnoDB INFORMATION_SCHEMA Metrics Table”. For information about other data provided by the INNODB_BUFFER_PAGE table, see Section 25.39.1, “The INFORMATION_SCHEMA INNODB_BUFFER_PAGE Table”. For related usage information, see Section 15.14.5, “InnoDB INFORMATION_SCHEMA Buffer Pool Tables”. For information about monitoring InnoDB mutex waits, see Section 15.15.2, “Monitoring InnoDB Mutex Waits Using Performance Schema”.